After a drug induced psychotic episode, 16 year old Violet finds herself admitted to the local psych. ward waiting to find out if she will be charged for attacking her younger brother, Will, with a knife – something she doesn’t remember doing. What she does remember from the same night is seeing her sister Rose, who had run away from home a year before and who no one in the family is allowed to talk about. Rose hasn’t been heard from since she ran away. And no one else saw her that night but Violet. Just when she starts to question her sanity, and think she is the crazy screw-up her mum has always said, Violet gets a letter from Rose and starts to realise it’s not her who’s messed up, it’s her mum Josephine. Josephine who, to the rest of the world, is the perfect wife and mother but is actually a liar who manipulates everyone she professes to love in order to get her way. At least if you ask Violet. Will would tell another story, one of a mum who would do anything to protect and take care of him. 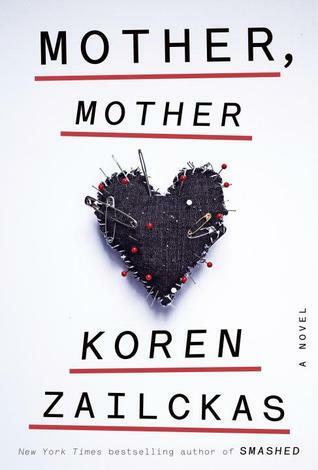 I had been looking forward to reading this book, Koren Zailckas’ debut novel, after reading some really positive reviews and I very much enjoyed it. Whilst the subject, that of a domineering mother, is one I’ve come across before the telling of the story from the perspective of the two children, both of whom had a very different view of what was going on, was an interesting take on it. Mother, Mother was well written with a good pace. There was always something happening and few wasted scenes. I felt that Koren Zailckas knew what she wanted to say and what she wanted the book to achieve. I wanted to know just what Josephine would do next and thought that there was a good twist at the end. Because the story was written from their viewpoint, Violet and Will were well rounded characters. I especially felt for Will because he was so young and innocent and so at risk. Josephine was painted as either good or bad, depending on who was telling their tale but this made sense for the story. Their dad was not as solid and I felt I didn’t understand him or his behaviour that well. My two criticisms would be that there were a few places where I felt I was getting a bit beaten over the head by just why Josephine was so rotten (these scenes were mainly spoken by other patients in the hospital with Violet and I found I skimmed these sections – to me, for teenage girls, they were all a bit to knowledgeable about Josephine’s condition). The other, that the ending felt somewhat rushed. Neither of these would put me off reading another book by Koren, however, because I think it’s a great debut and I would definitely recommend it to others. Note: I received a copy of this book in return for a fair and honest review. All opinions / ratings are my own.